They’re the “position zero” results when people Google certain keywords. Like other SERP features, they deserve a spot in your SEO strategy. 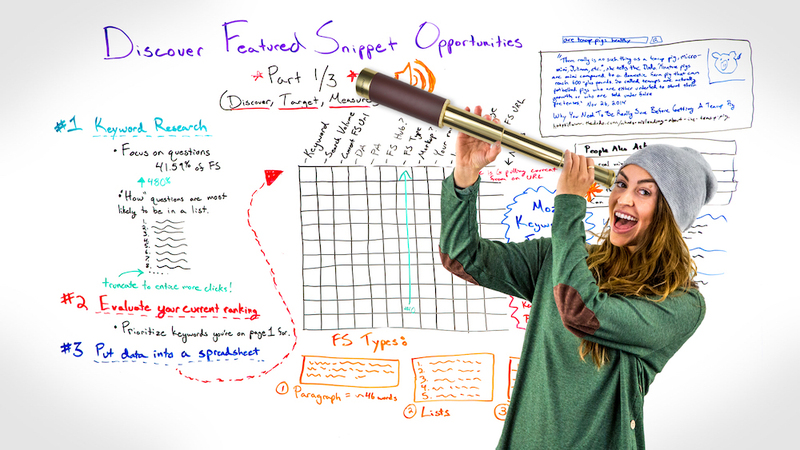 Which is why we’re lucky Moz’s Britney Muller is hosting a three-part WhiteBoard Friday series on how to get your content in featured snippets. She’s putting together some really helpful material. You should check it out—here’s episode 1. I’ve found Ahrefs to be a fantastic all-in-one tool to use for this kind of work. It can do most of the heavy lifting on the work that Britney’s prescribing—and quickly. So I put together a tutorial to help anyone new to the snippetscape. Here’s how to execute Britney’s training in Ahrefs yourself! Oh, and just for clarity: I’m a non-affiliate currently on the Standard Ahrefs plan ($149/mo, paid annually). If you’re working with a small site or in a small market, you could probably pull this off with their Basic plan. By the end of this post, you’ll see just a tiny reason why I’m so happy to pay that. To start, put your domain into Ahrefs’ Site Explorer. Hit that button and we’re off! This gives you an overview of your domain. But what we really want to see is your organic keywords. Ahrefs will show you the master list of everything your site ranks for. We’ll focus on keywords that already rank in the top 10 positions. In 2017, Ahrefs’ data was 99.58% positive that featured snippets only reference pages already in the top 10 results. 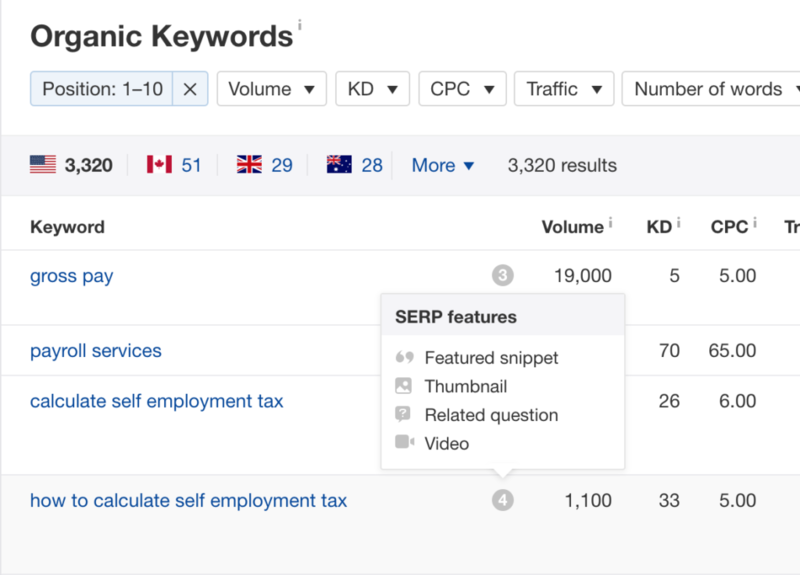 Since we’re specifically looking for snippet opportunities, we’re going to focus on keywords that we rank 1–10 for. 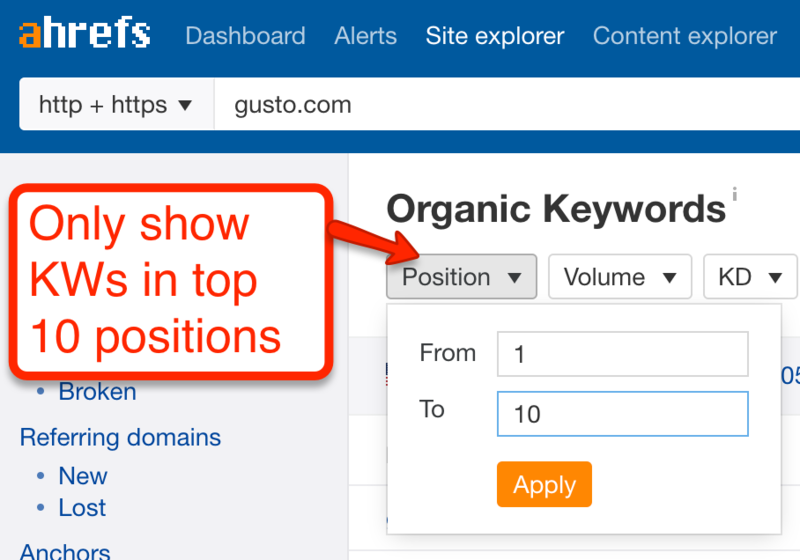 That’s easy to do: just filter the “position” column in Ahrefs. Now we see all the keywords that we’re currently in the top 10 positions for. So we have all the keywords we rank for. Now we need to find out which of those keywords get featured snippets. Cool thing about Ahrefs: we can find that answer in just a few clicks—without needing to export to a spreadsheet yet. And just like that, you get a list of every keyword that currently has a featured snippet result. In Gusto’s case, it looks like they have several thousand potential snippet opportunities. Granted, there will be a lot of duplicates here—more on that later. If you look over to the right, next to your URLs, you’ll see a few quotation mark icons. 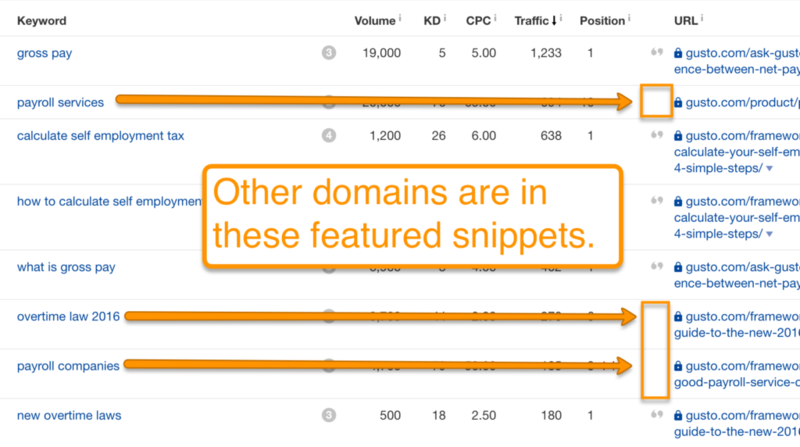 These icons indicate that you already hold the featured snippet for this keyword. On some rows, you won’t see those little curly quotes. For these keywords, someone else has the featured snippet spot. We’ll deal with those soon. A quick note here. See those bubbles next to search volume—the ones with the little numerals in them? That’s another really cool Ahrefs feature. 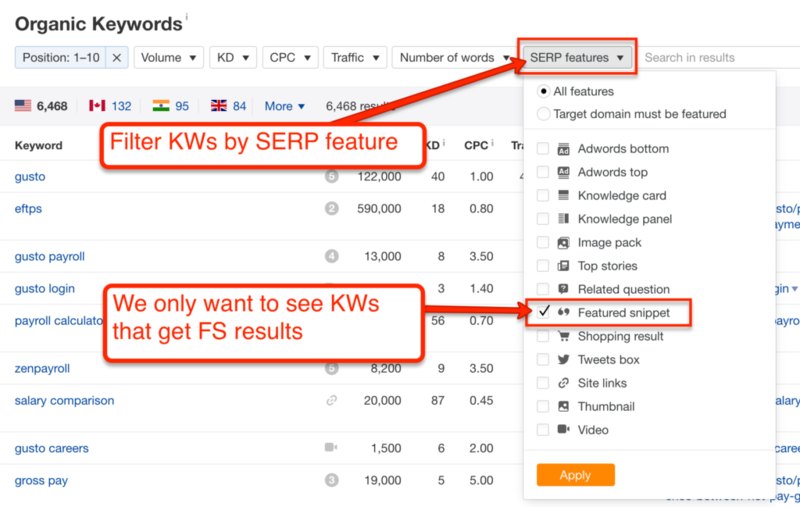 These give you an overview of all the SERP features associated with that keyword. So, if want to get an idea of what sorts of SERP features you’re up against, just click on those bubbles to get an overview. 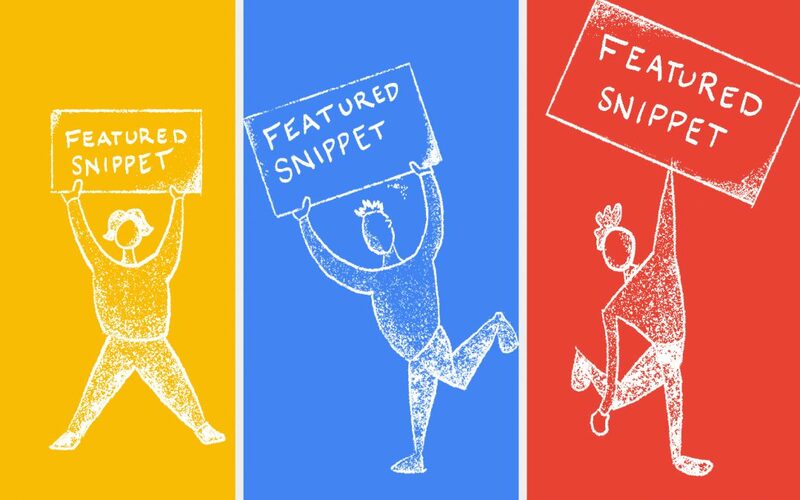 So now we have a list of every featured snippet within reach. If we were working with a small site, we could just work off this screen alone. But since we have so many potential snippets to grab, let’s export this data. You’ve scrolled through a lot of screenshots, but when you stitch all the work we’ve done thus far together, it takes less than 30 seconds. If you’re only chasing a few specific snippets, skip this step. 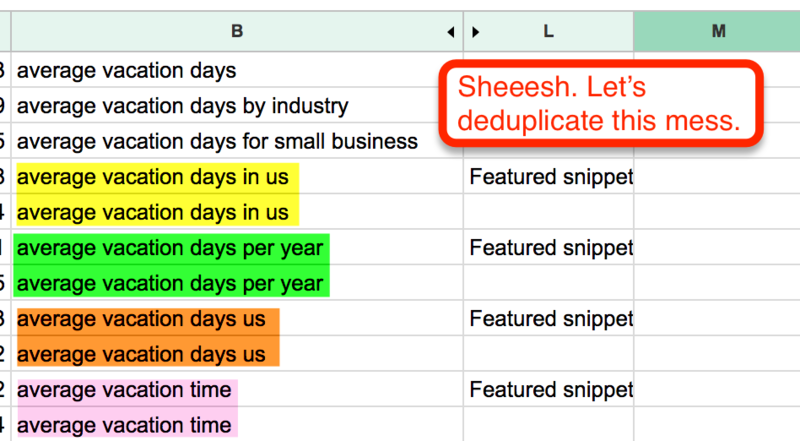 But if you’re taking a comprehensive approach to optimizing your site for snippets, you’ll want a spreadsheet. I’ll show you how I set mine up in Google Sheets. You’re welcome to grab a copy to use yourself—no signup necessary. It has all the formulas I used, so it’s ready to go. The raw tab is where I put that big export of all my featured snippet opportunities from Step 2. It’s a lot of data, and as you work your way through it, you’ll realize that a good deal of these keywords are duplicates. That’s because Ahrefs counts each instance your website ranks for a given keyword. Remember, almost every single featured snippet comes from a result on the first page anyway—which means every featured snippet you own will result in a duplicate keyword. So at this point, you’ve got your spreadsheet set up with raw data on your domain and a list of unique keywords. Up until now, we’ve been playing with our own site data in Ahrefs—which is pretty straightforward. But now it’s time to get busy collecting data on everyone who currently occupies the featured snippets we don’t. 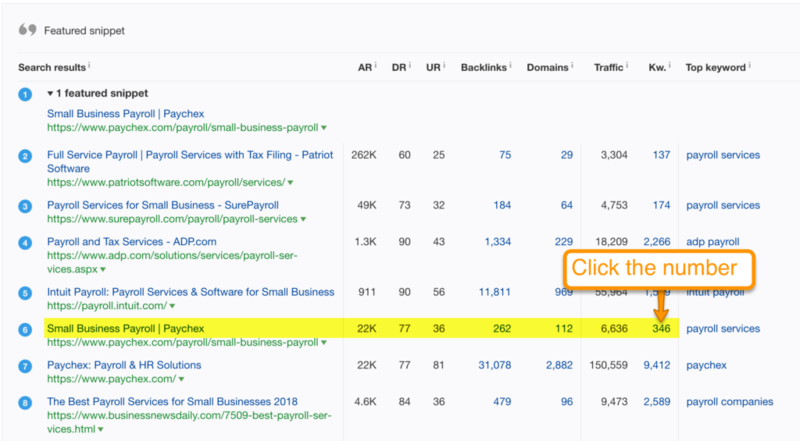 Let’s go back to the Organic Keywords report in Ahrefs (the one we exported in Step 2) and take a closer look at the first snippet that we aren’t occupying. This shows you what Google’s currently fetching for the average SERP on this keyword. You can see which URL is occupying the featured snippet right away. First, we’ll find where that URL shows up in the non-feature results. Then, we’ll look up the keywords that URL ranks for. Here we are again: looking at a set of organic keywords. But this time, we just want to find all the snippets this specific URL is featured in. And Ahrefs makes that very, very easy. 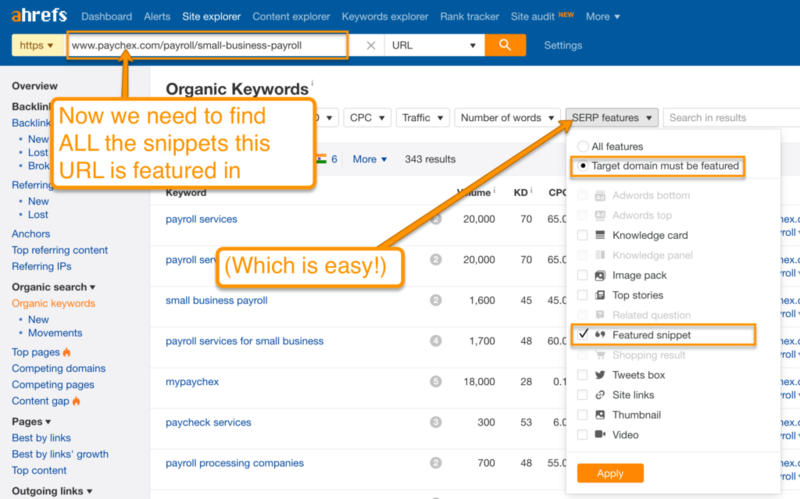 All you need to do is tell Ahrefs that the “Target domain must be featured” in the SERP features drop-down menu. Once that’s done, you’ll see a beautiful sight: every single snippet this URL appears in. Export that puppy. 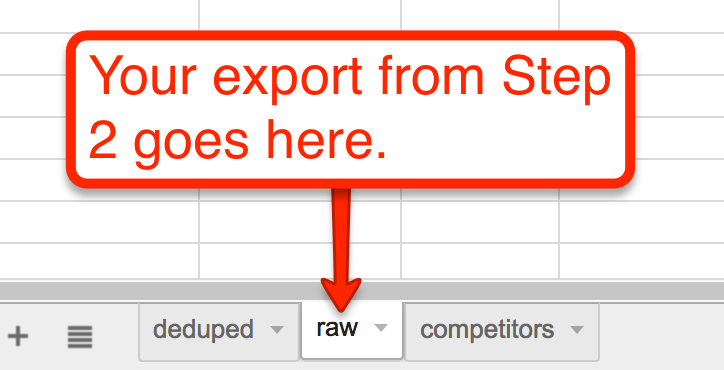 Now, you’ll want to dump the data you exported on this one page into the “competitors” tab in your spreadsheet. Which snippets do we already hold? Which snippets does someone else hold? Who occupies those other snippets? … which tells my dedupe tab to check my raw data to see if my domain is in a featured snippet. If it is, then we get a “Yes.” If not, “No.” Some conditional formatting makes it easier to know at a glance whether or not we’re in that coveted snippet (that’s where the red/green comes from). Now we’ll want to have an idea of which URLs are occupying the featured snippet spot—regardless of whose domain they’re on. We can do that with a little creative functioning, too. … which tells the cell to replicate my domain’s URL if I already have the featured snippet, or pull from the competitors tab if I don’t. 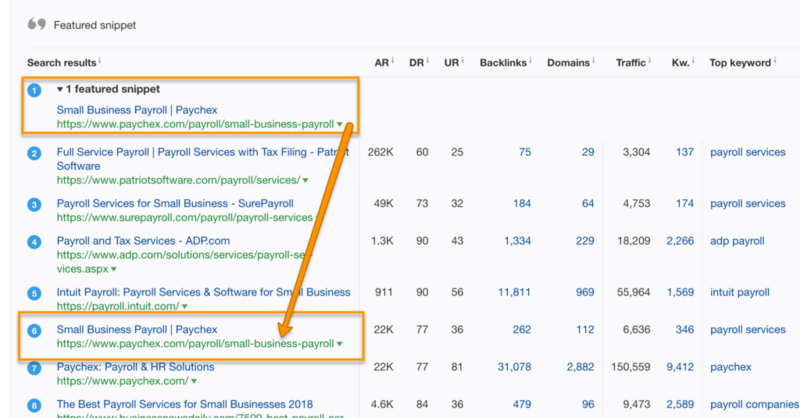 From here, you can start plugging in things like the featured snippet type (list, paragraph, or table), domain authority, or whatever else you find important. Keep plugging away at competitor snippets until you have data on all the keywords you think are valuable. If you do this, you’ll be well set up to do target strategic snippets—and get the most out of following along with the rest of the videos in Britney’s series. Super cool and constructive guide. Thank you. Now it is a lot easier to prioritize which URLs I should work with.